Click on an event for more details and sign-up information. During Lent, we will be reading through the Gospel of Luke and the book of Acts as a church using the Youversion Bible app (downloadable on Apple App Store or Google Play). You can follow along and share thoughts by joining the reading plan through the link below. The plan starts Mon 3/4, but you can jump in any time! On April 19 we hope you'll join us for our Good FridayTenebrae gathering. It is a sacred and special time of remember our Lord's death. This year there will be childcare for crawlers - pre-K and special kid's programming for ages K-5th, but you do need to register your children. On April 27th, Pastor David Wu will be teaching the Enneagram Workshop at The Fellowship church in Katy, TX, where we learn about the Enneagram, an incredibly helpful tool for self-awareness and discipleship. Participants take an online WEPSS Enneagram assessment in advance of the workshop. With detailed and personalized results in hand, we'll spend the morning together exploring the self-discovery insights offered by this ancient tool. G2G (Get-Together Group) will be hosting a baking contest on Saturday 4/27! . There will be two categories - sweet and savory, with a prize for First and Second place in each category. We invite everyone to also bring or e-mail their recipes so we can make a digital Access Cookbook to share with all. Come join us for some baked goods and board games! Come join us on Sunday 12:00 pm in Meeting Room 1.01 (Staff Office) for our "Monthly Dialogue on Race". This will be a time of sharing personal stories and reflections about race issues, in a safe and respectful space. You are welcome to bring your own lunch. If you have questions, feel free to contact recingcrew@accesslive.org. The Access Pastors will host a monthly brown bag lunch on Sunday 4/28 12 PM - 1 PM for those interested in discussing the message series or asking faith questions in general. It's bring-your-own-lunch in Room 1.06 (Cry Room). Note that the pastor(s) in attendance each month will change. 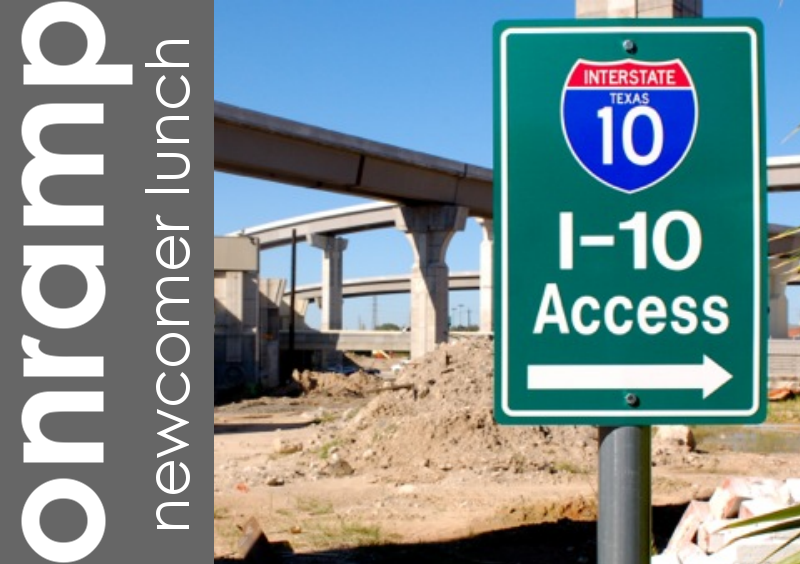 If you've recently started coming to Access, we'd like to invite you to our quarterly Onramp Newcomer's lunch on May 5th @ 12:00 PM - 1:30 PM. Onramp is a casual and fun way for us to introduce people newer to Access to what we're about and give folks a chance to connect with other people in our community. We know that plugging into a church can be pretty daunting, so our hope is that this would help make that transition a little bit easier. Please RSVP below for lunch. On April 16-17, our team will be facilitating a one-night soul care retreat called The Voice of Jesus at the Holy Name Passionist Retreat Center. In spacious places, find a quiet spot to listen for the voice of the one who calls us Beloved. The retreat begins at 9AM Tuesday and concludes at 1PM Wednesday, and will include small group sharing, worship, teaching, and times in silence and solitude. 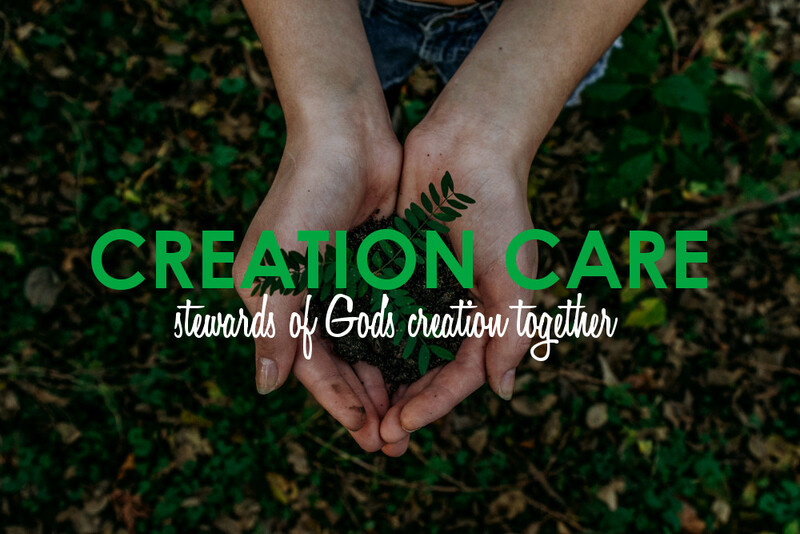 The newly formed Creation Care group at Access is inviting members of the Access community to join them on 2nd Sundays of each month beginning October 14, 2018 from 12:00 PM - 1:30 PM, to discuss the study guide at the back of thebook, "Tending to Eden" by Plant with Purpose's Scott Sabin, together and also to have conversations around how to better practice creation care at Access and in our communities at large. BYOL & light snacks provided. We will endeavor to make all of our meetings and events “zero waste”, so please plan to “pack in and pack out” whatever you bring. At Access, Mission Partners are the committed members of Access who are moving us forward in mission and learning to embody the core values of our church. The mission partnership process is meant to be a rich discipleship experience and a way to make a deeper commitment to the church. You’ll learn more about our vision and values as well as what it means to commit to Access as a member. Mission Partners vote on our budgets, constitutions and pastoral changes. 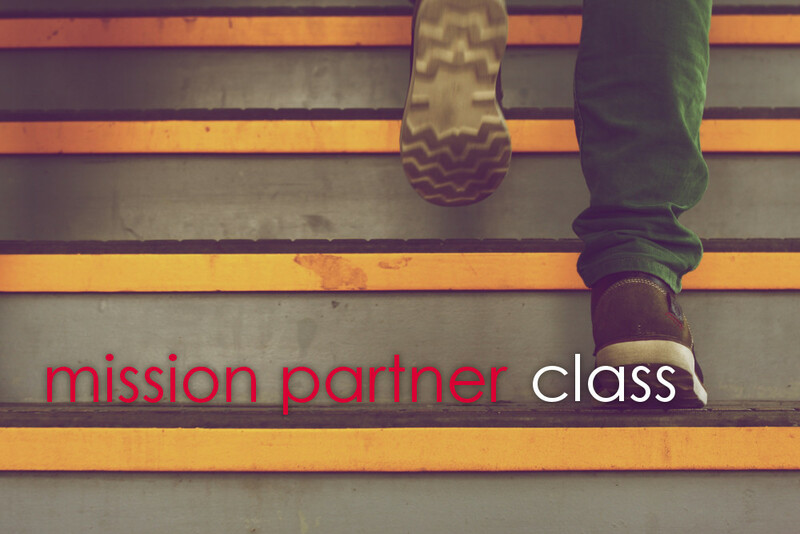 If you’ve been attending Access and are interested in learning more about Mission Partnership, join us for the upcoming class in room 1.06 (Cry Room). Please RSVP if attending! 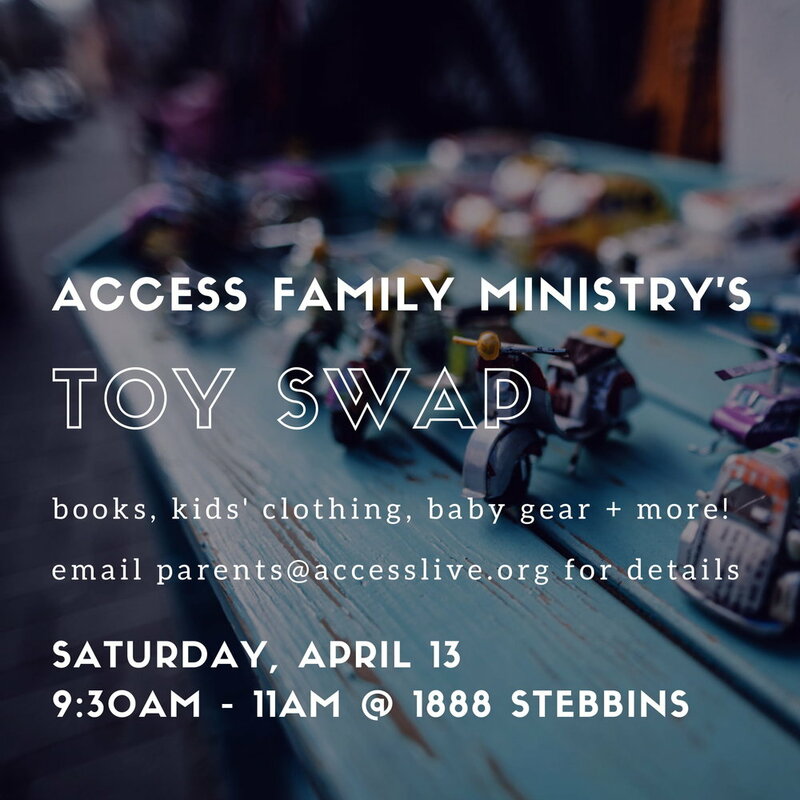 It’s time for the Access Family Ministry’s Clothing & Toy Swap again! As usual, we'll have breakfast together, give some announcements, and start picking out items. This year we need YOUR help to set up/clean up the swap. Volunteers will get first dibs on swap items. See the evite link below to RSVP and find Sign Up Genius link to sign up for a volunteer slot! Join us for our Infant Dedication during the Faith Village worship gathering on Sunday March 31! 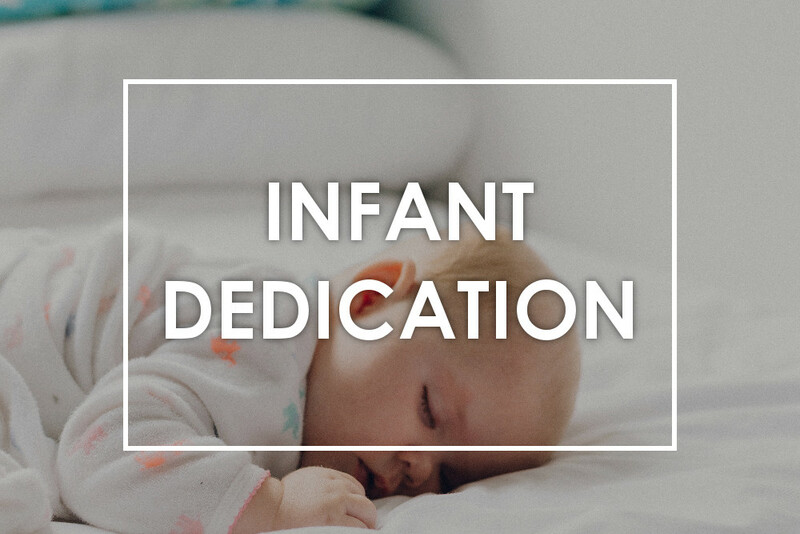 If you are interested in finding out more about dedicating or baptizing your infant and would like your child to be put on the waitlist for our next dedication, please contact Grace Lin. Access Men, join us for a day of crawfish, bbq, and connecting. Saturday, March 30 at 11:00 AM at Access. We're looking for hands to help in a variety of ways - whether that's coming early to help set up, cook crawfish, clean up, or bring food. Please see the invite for more information. RSVP to let us know you're coming and if you can help! Be sure to invite your friends! Sharing stories goes back to the most fundamental ways of building human connections. Vox Culture feels that it pays to sometimes dig back through our layers of modernity and embrace the calm poise of storytelling; all in an attempt to know each other better. 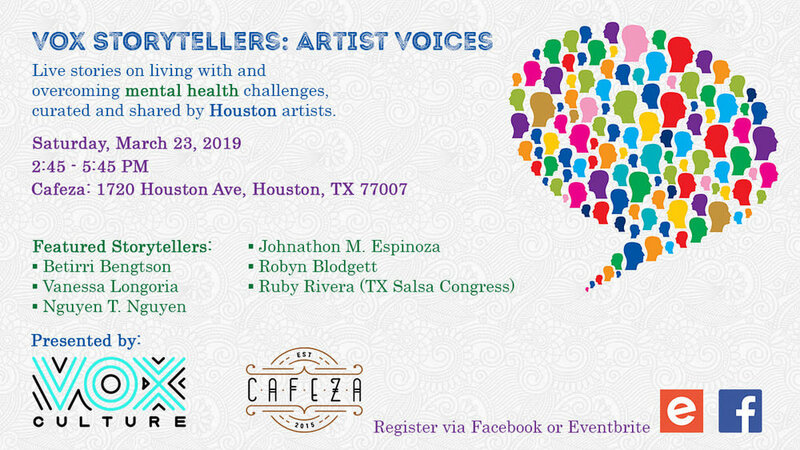 The goal of this event is to connect Houstonians together in a deeper, more thoughtful way. Register: Event is free by please RSVP below. The Access Pastors will host a monthly brown bag lunch on Sunday 3/24 12 PM - 1 PM for those interested in discussing the message series or asking faith questions in general. It's bring-your-own-lunch in Room 1.06 (Cry Room). Note that the pastor(s) in attendance each month will change. 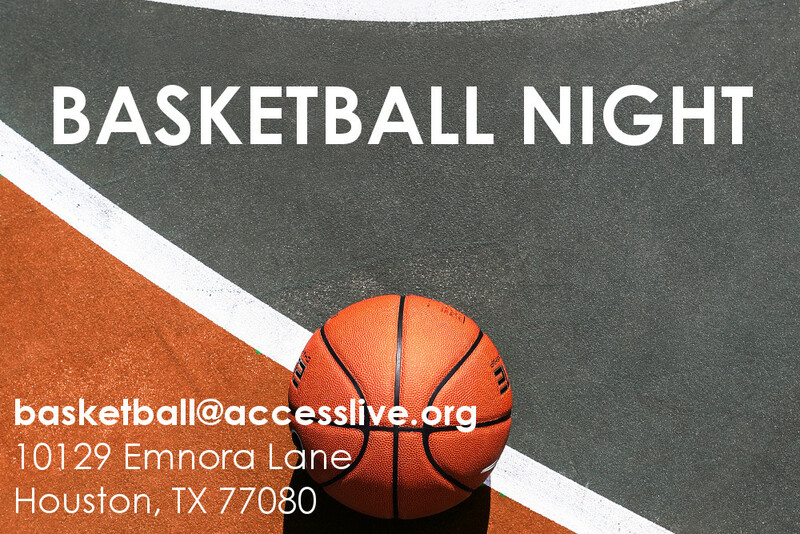 Join the Access Basketball Ministry for a fun night of getting your bball game on at 10129 Emnora Lane, Houston, TX 77080 on Saturday 3/23 at 8 PM! Contact basketball@accesslive.org if you plan on coming so Dave Tien can get a headcount. The Hangout ministry embraces each outing with our neighbors in Hermann Park like any other time among friends - with games, music, and casual conversations. It's a being-with relational ministry that finds people where they are, and engages them with God's love in practical ways and physical presence If you're interested in joining, please contact hangout@accesslive.org. See this page for more information: http://www.accesslive.org/activity-groups/. A group from Access goes out each second Saturday of the month. We will meet at Access at 8:30 AM and head out to Hermann Park at 9:30 AM together. Baptism is an outward expression of an inward spiritual reality. God invites us to be baptized to remember his work in our souls in salvation. If you’d like to learn more email Ted Law. Class will be held March 3 at 12 noon. Bring a lunch! Attendance does not necessarily mean you have to be baptized. Our next baptism will be on Easter Sunday April 21. Description: What are the postures, beliefs, and practices that make for a healthy marriage? 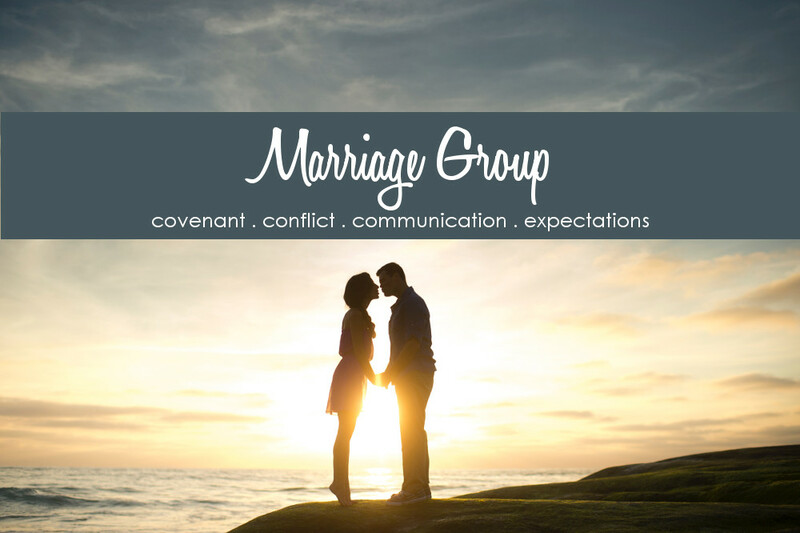 The Marriage Group is perfect as a pre-engagement/pre-marital preparation class or for couples already married but looking for a refresher around the hard-to-master basics. Topics include covenant, conflict, and communication. Upon completion, couples will have the opportunity to pursue further individualized premarital preparation via the Enneagram, SYMBIS, and Prepare/Enrich. Requirements: In order to maximize sharing and learning, couple are asked to commit to attending three out of the four group meetings. Please check your calendar before signing up. Meetings will take place at John and Grace Lin's home in Sugar Land and at 1888 Stebbins. Come join us on Sunday 12:30 pm in Meeting Room 1.01 (Staff Office) for our "Monthly Dialogue on Race". This will be a time of sharing personal stories and reflections about race issues, in a safe and respectful space. Sunday 2/24, there will be a church-wide lunch right after service followed by our Quarterly Mission Partner Gathering (those interested in mission partnership and happenings at Access are also welcome to attend). Lunch is $5/person and childcare will be provided, but we ask that you please register by 2/17 so we have an accurate headcount for food. Interested in joining the worship team? There's a significant need for add'l drummers, bassists, pianists, guitarists and worship leaders. Email worship@accesslive.org to find out more about the application process. 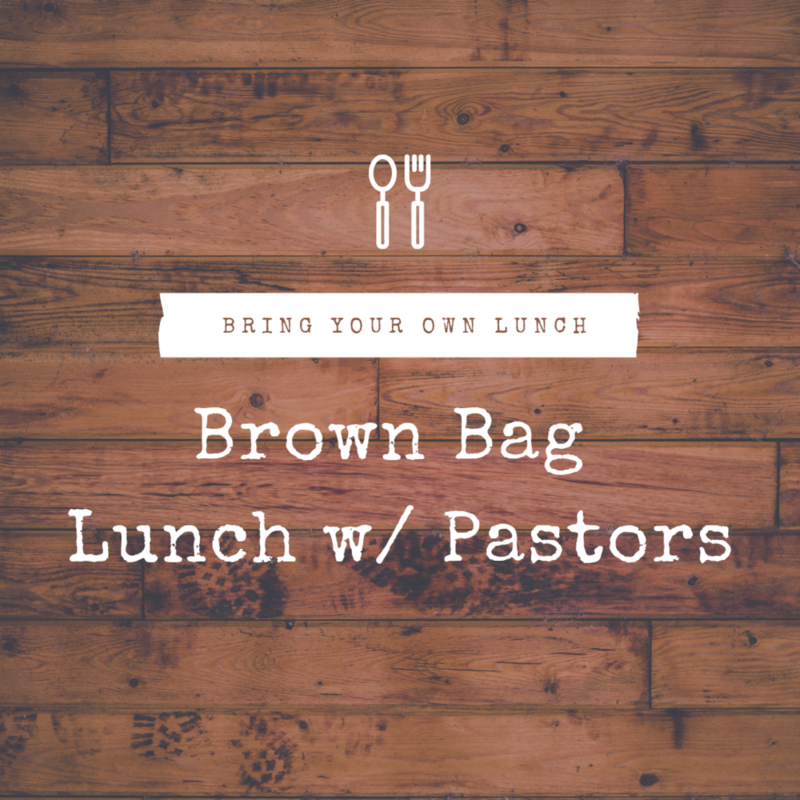 The Access Pastors will host a monthly brown bag lunch on Sunday 2/17 12 PM - 1 PM for those interested in discussing the message series or asking faith questions in general. It's bring-your-own-lunch in Room 1.06 (Cry Room). Note that the pastor(s) in attendance each month will change. Join the Access Basketball Ministry for a fun night of getting your bball game on at 10129 Emnora Lane, Houston, TX 77080 on Saturday 2/16 at 7 PM! Contact basketball@accesslive.org if you plan on coming so Dave Tien can get a headcount. Your in-laws. Your parents. Your spouse. Your cherished friendships. Navigating the relationships that matter most to us as adults requires more than good intentions. We need to develop strong guiding principles that can help us do more than coexist, avoid, or just accommodate. In this workshop, discover how to stay true to yourself (defined) while staying engaged with the people you love (connected). This paradigm is a true relationship game-changer! 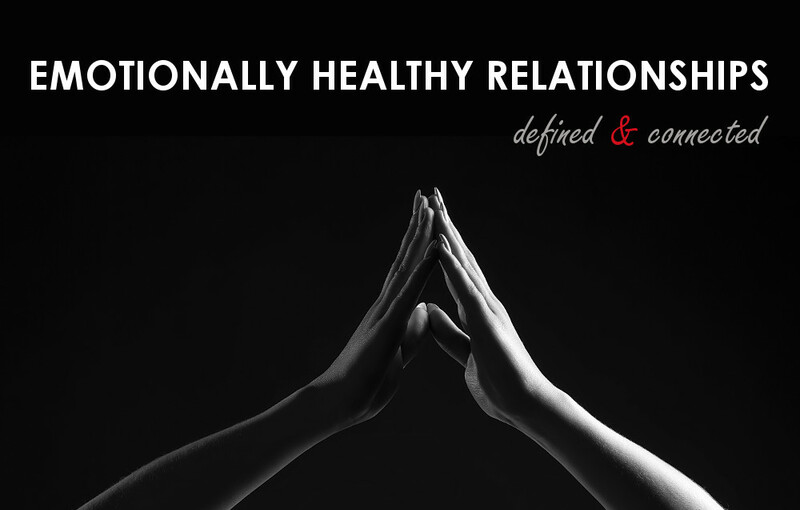 You'll leave with a stronger understanding and practical tools to engage in healthier relationships. Taught by John Lin and Trisha Taylor. The Hangout ministry embraces each outing with our neighbors in Hermann Park like any other time among friends - with games, music, and casual conversations. If you're interested in joining, please contact hangout@accesslive.org. See this page for more information: http://www.accesslive.org/activity-groups/. If you've recently started coming to Access, we'd like to invite you to our quarterly Onramp Newcomer's lunch on Feb 3rd @ 12:00 PM - 1:30 PM. Onramp is a casual and fun way for us to introduce people newer to Access to what we're about and give folks a chance to connect with other people in our community. We know that plugging into a church can be pretty daunting, so our hope is that this would help make that transition a little bit easier. 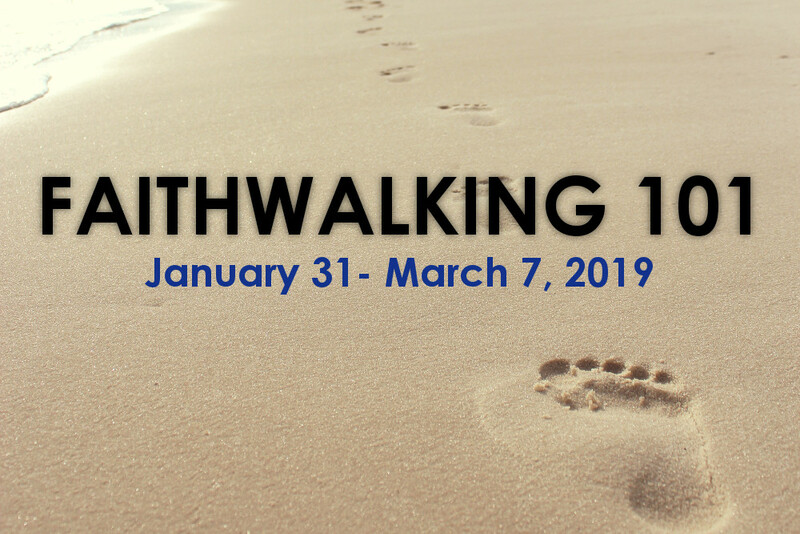 Faithwalking 101 is the beginning of your spiritual formation process. During FW101 participants hear presentations about being fully human and fully alive according to God’s design and how that makes a difference in their world. The next learning group will be ONLINE via Zoom Video Conference led by Victor Chiao January 31 - March 7, Thursdays from 7:00 PM - 8:30 PM. Fuller Seminary Texas is pleased to host “Ministry in Multicultural Neighborhoods”, a lecture by Dr. Juan Martinez, Professor of Hispanic Studies and Pastoral Leadership on January 29, 2019. He will discuss the rapidly changing world we live in, where people from many different nations encounter each other. Our changing world creates a unique opportunity to share the Good News of Jesus Christ and develop communities of believers that reflect the diversity of our world. 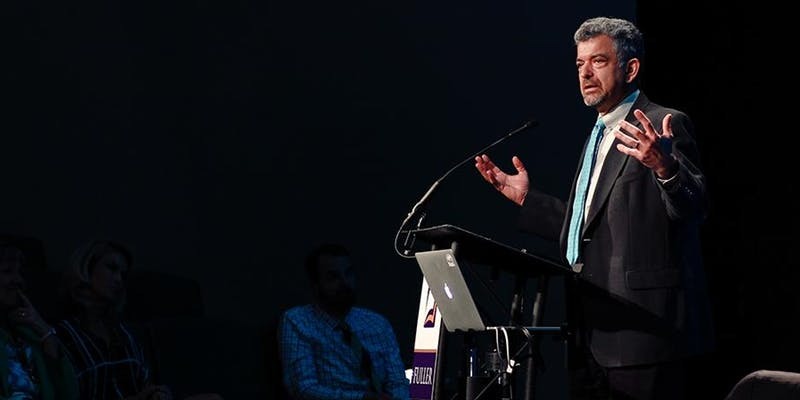 Dr. Martinez will explore how these encounters produce unique challenges that need to be named and addressed to successfully reach others and be the Church of Jesus Christ together. This lecture is free and open to the public. Online registration is required. Come join us on Sunday 12:00 pm in Meeting Room 1.01 (Staff Office) for our "Monthly Dialogue on Race". This will be a time of sharing personal stories and reflections about race issues, in a safe and respectful space. Come celebrate the start of the new year with good company and great food at Access on Jan 26 at 6:30 pm!. Bring and share your favorite dish! All Access volunteers and leaders are invited to our Spring Leadership Launch. This is a gathering to provide vision, encouragement, training and connection for all of you who help make Access function as a community. Childcare will be available. Please register below. If you’ve been attending Access and are interested in learning more about Mission Partnership, join us for the upcoming class in room 1.01. Please RSVP if attending!